Color:Set of 1 Color:Set of 1 The Dry Erase Lapboards are double sided, have practice lines for learning to write letters on one side. On the other side is plain white, which is great for class games, math lessons, reminder and drawing for Kids. 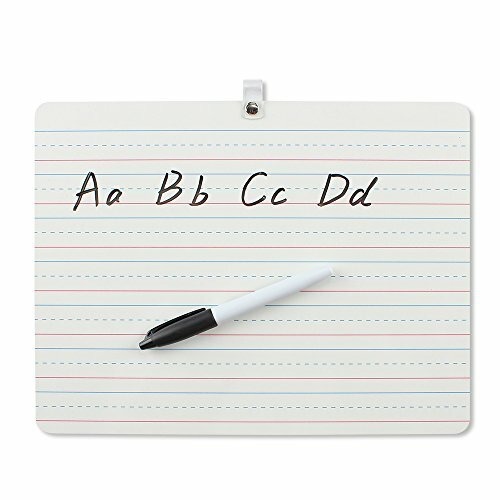 The lap board size is 9x12 inches, which is very portable on the travel, and comes with a dry erase marker.The dry erase lapboard's rounded corners are safe for students in the classroom. The pre-printed lined side is great for penmanship and sentence writing.It is very environmental, you can write any things on it, then wipe off, and re-use with no waste. This portable double sided lap board is perfect for use at the kitchen table or to take on long car rides! Rounded corners for safety in the classroom or wherever you want to practice your penmanship. Compact for easy transportation and comes with a dry erase marker.The dry erase board is a useful teaching tools for every teacher or parent, who are teaching any thing to their children!